Subject : Updation of Master data and submission of changed information in Format-F for E-scrolls. Sub: Appointment against Scouts & Guides quota – clarification regarding. Ref: South East Central Railway’s letter No. P-HQ/RUL/101/3/5509 dated 31.05.2017. 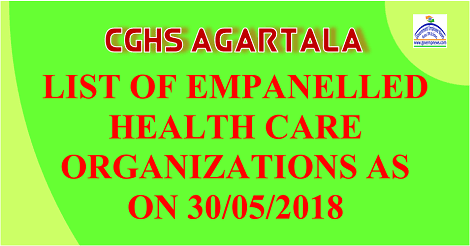 LIST OF EMPANELLED HEALTH CARE ORGANIZATIONS AS ON 31.05.2018 IN CGHS Lucknow. 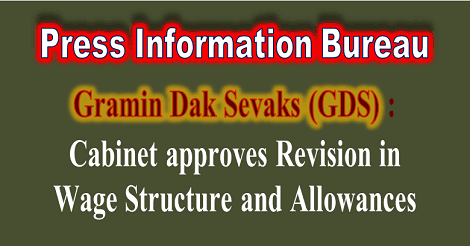 Subject: Implementation of recommendations of one-man committee on Social Security Benefits for Gramin Dak Sevaks (GDS). Subject: Introduction of Maternity Leave for the female Gramin Dak Sevaks (Female GDS) in the Department of Posts. The Chief Administrative Officers, DMW, Patiala and Rail Wheel Plant, Bela, Patna. 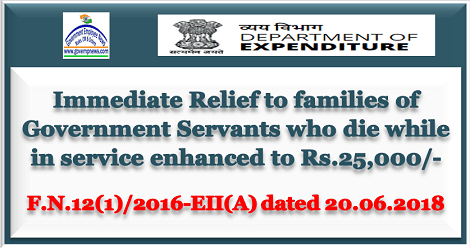 Sub: Removal of age limit of 25 years of medical facilities for dependent children of serving Railway employees and pensioners. Subject: E-scroll to process the revision of pension cases. All Indian Railways including PUs and RDSO. Sub:- Subscription rates of RELHS — regarding. Ref:- Railway Board’s letter No.2017/H/28/1/dated 23.02.2017. I ................................................................ Gramin Dak Sevak (ABPM/BPM) hereby undertake that any excess payment that may be found to have been received by me as a result of incorrect fixation of Time Related Continuity Allowance (TRCA) or any excess payment detected in the light of discrepancies noticed subsequently will be refunded by me to the Government either by adjustment against future payments due to me or otherwise. GDS wage Revision : Payment of Arrears for the period from 01.01.2016 to 30.06.2018. 8 Payment for the Period from 01.01.2016 to 30.6.2018. The annual increase of TRCA is 3%. After fixation of TRCA in the appropriate stage in the TRCA Matrix /slab as specified in Para 2.2 above, the next annual increase will be effected after completion of 12 months of continuous engagement from that date subject to para 3.2 below. Subsequent increase in TRCA scale shall be at the immediate next stage in the respective levels of new TRCA matrix at Table 3. The entire GDSs posts shall be brought under two categories viz. Branch Postmasters (BPMs) and other than Branch Postmasters. 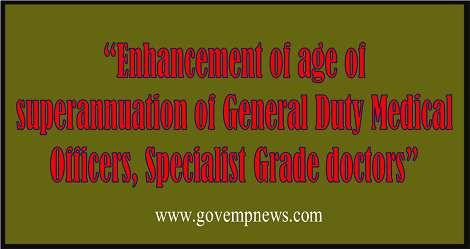 GDSs other than BPMs and working in Branch Post offices shall be designated as Assistant Branch Postmaster (ABPMs) and GDSs working in departmental offices shall be designated as Dak Sevaks. There shall be two slabs of working hours Viz. Four (4) and Five (5) hours and two levels of TRCA slabs each for BPMs and other than BPMs. For this purpose, the working hours of GDSs with 3 hours, 3 1/2 hours and 3 hours 45 minutes shall be revised to 4 hours and those with 4 1/2 hours workload shall be revised as Five (5) hours, with effect from 1.7.2018. Sub: Ration Money Allowance during leave other than LAP. Child Care Leave : Limit of 22 years in case of disabled child removed. Sub:- Grant of Grade Pay Rs.6600/PB-3 to Nursing Personnel i.e Staff Nurses/Nursing Sister/Matron/Chief Matron under 3rd MACP. 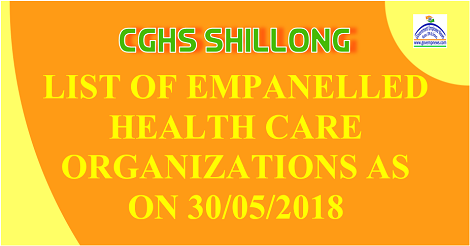 Subject: Change in nomenclature of Nursing Staff in CGHS-regarding. Railway Order: Revision of designations of erstwhile Gruoup 'C' Nursing Staff. Sub:- Revision of designations of erstwhile Group ‘C’ Nursing staff. 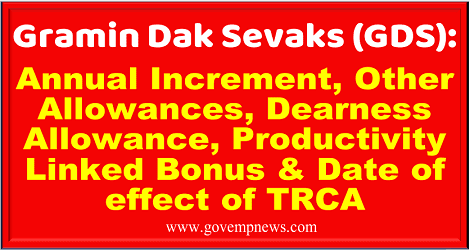 Sub: Continuance of “Special Allowance” to Teaching Staff in NVS - reg. Sub:- Rate of levying of ‘Superannuation Charges' for inclusion in the ‘Production Accounts' of ‘Ordnance and Ordnance Equipment Factories’. Subject: Restoration of pension in respect of Defence Service Personnel who had drawn lump sum payment on absorption in Public Sector Undertakings/ Autonomous Bodies — delinking of qualifying service of 33 years for revised pension with effect from 1.1.2006 reg. 7th CPC TA Rules - Ceiling prescribed for reimbursement of Hotel accommodation/Guest house is exclusive of all taxes and these taxes shall be reimbursed over and above the ceiling limit. Subject: Implementation of eHRMS in respect of CSS / CSSS / CSCS officers – Information regarding PAO Code/DDO Code. Subject: Implementation of eHRMS in respect of CSS / CSSS / CSCS officers. 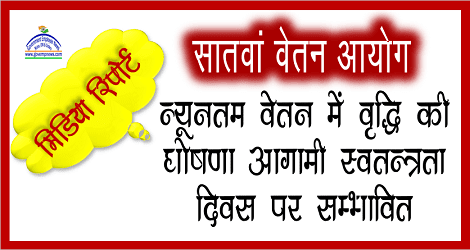 7 CPC in case of pensioners of pre-2016 of the (AYUSH) Research Councils - reg. Behind INA Market, New Delhi. 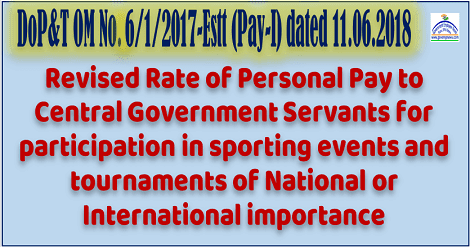 Subject:- Extension of 7th Central Pay Commission in the cases of pensioners of pre-2016 of the (AYUSH) Research Councils – regarding. 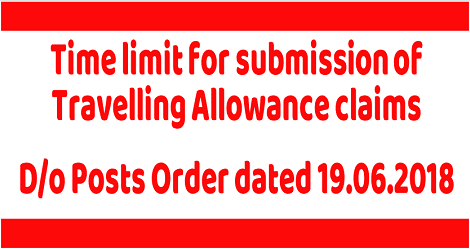 DA on Transport Allowance at pre-revised rates from 01.07.2016 @132% and from 01.01.2017 @ 136% is not admissible : Notings of DoE. References have been received from Department of Telecom, D/o Revenue and Central Secretariat (Promotee Assistants) Association seeking clarification regarding admissibility of DA on Transport Allowance at pre-revised rates from 01.07.2016 (@132%) and from 01.01.2017 @ 136%. 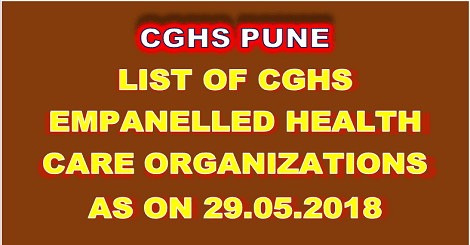 CGHS : Procurement of Generic Medicines under CGHS through M/s HLL - reg. 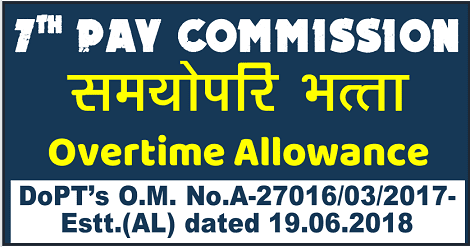 Sub: Grant of Overtime Allowance (OTA) to Railway Employees consequent upon revision of pay scales and Allowance-date of effect. सुप्रीम कोर्ट के आदेश के मद्देनजर केंद्र सरकार ने अपने सभी विभागों व राज्य सरकारों को एससी-एसटी के लिए प्रमोशन में आरक्षण लागू करने के निर्देश जारी किए हैं। सरकार ने मंत्रालयों, विभागों को कहा है कि सर्वोच्च अदालत के फैसलों के अनुरुप प्रोन्नति की अनुमति मंत्रालयों व विभागों को दे दी है। . 7th CPC : Revision of Pension/Family Pension (pre and post 2016) retired faculty and non-faculty of Centrally Funded Technical Institutions - reg. Subject:- Revision of pension as per 7th CPC to retired employees of KVS. Sub: Revision of pension as per 7th CPC to retired employees of Kendriya Vidyalaya Sangathan – Reg. 2. In this regard, it is clarified that the ceiling prescribed in para 2E(i) of the Annexure to this Department’s OM No. 19030/1/2017-E.IV dated13.07.2017 in r/o hotel accommodation/guest house, is exclusive of all taxes and these taxes shall be reimbursed to the Govt. employee over and above the ceiling limit.